First recorded by The Crickets (1957). Hit version by The Rolling Stones (US #43/UK #3 1964). Also recorded by Rush (CAN #88 1973), Tanya Tucker (1979). 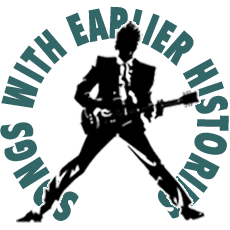 From the wiki: “‘Not Fade Away’ is credited to Buddy Holly (originally under his first and middle names, Charles Hardin) and Norman Petty, and was first recorded by Holly under the moniker of his band, The Crickets. The group recorded the song in Clovis, New Mexico, on May 27, 1957, the same day the song ‘Everyday’ was recorded. The song’s rhythm pattern is a variant of the Bo Diddley beat; Crickets drummer Jerry Allison pounded out the beat on a cardboard box. “Contrary to the depiction in the 1978 film The Buddy Holly Story, ‘Not Fade Away’ was NOT the last song Holly ever performed before his fatal plane crash. In a 50th anniversary symposium held in Clear Lake, Iowa, where Holly last performed, discussion panel members Tommy Allsup, Carl Bunch, and Bob Hale – the emcee at that final show of February 2, 1959 – all agreed that the final song of the night was Chuck Berry’s ‘Brown Eyed Handsome Man’, performed on-stage together by all of the acts. First recorded by Buddy Holly, writer (1958, released UK #39 1964). Hit versions by The Crickets (UK #26 1959), Bobby Fuller Four (US #26 1966), Cochise (US #96 1971). From the wiki: “Love’s Made a Fool of You’ was co-written and originally performed by Buddy Holly in 1954. It was first recorded in 1958 by Holly as a demo for The Everly Brothers (who chose not to record it). Holly’s demo would be posthumously released in the UK in 1964 on the Peggy Sue Got Married EP; charting in the UK Top 40. The song would be covered by The Crickets (Holly’s backup band) in 1959, becoming the group’s first single to be released following Holly’s death, but would be more famously covered in 1966 by The Bobby Fuller Four (who also covered The Crickets ‘I Fought the Law‘ the previous year). First recorded by Buddy Holly (US #82/UK #30 1958). Hit versions by The England Sisters (UK #33 1960), Showaddywaddy (UK #7 1975), Nick Berry (UK #2 1992). Also recorded by Herman’s Hermits (1965), The Hollies (1980). Co-written and originally recorded by Sonny West (Feb 1958). Hit version by Buddy Holly (US #37/UK #5 1958).